Combine balsamic, honey, garlic, onion & paprika in a small bowl. 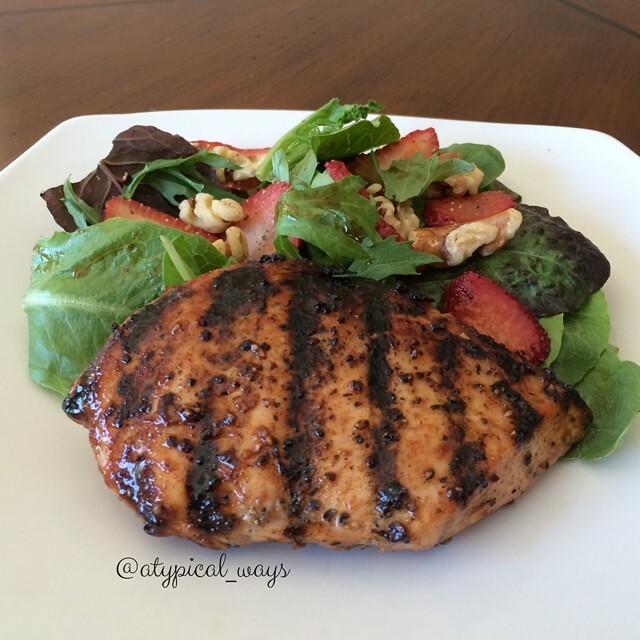 Wash & dry chicken breast and season with fresh ground pepper. Place chicken in a zip loc bag and pour all but 1tsp of the marinade into the bag. Set the 1tsp of marinade aside to baste with later. Allow chicken to marinate in the refrigerator for at least one hour. Pre heat grill to medium-high heat and grill chicken for about 8 minutes on each side or until cooked through depending on chicken breast thickness. Serve with spring mix, strawberries & walnuts. « Super easy homemade Gummy Bears!